Your house is typically made of a plastic exterior siding known as vinyl siding. It's used for waterproofing and decoration. It imitates the feel of wood clapboard without the downsides of such (wood rot or termite infestations). It's also the more affordable alternative to tough material like fiber cement siding or aluminum siding. This engineered product is made primarily of PVC or polyvinyl chloride resin (the same material used in PVC pipes). So can you paint vinyl siding? Yes. And here's how. 4. Should You Put on Primer? Before painting your vinyl siding, you should check the warranty on it. Sometimes, putting paint on it can void the warranty. It's better to paint it after your warranty is gone instead of before it's gone. Because it's wasteful to void your warranty when it's still active just because you want to paint your vinyl siding a different color for aesthetic reasons. It's better to do so once the warranty period has passed. Even if the warranty allows you to paint the siding, read the fine print and look for loopholes. You don't want to end up voiding the warranty by accident because you only skimmed through the stipulations. To be more specific, make sure to comply with what color and type of paint to use that won't nullify and void your warranty. Don't buy the nearest can of paint you can find on the aisle of a hardware store. Sure, you should pick a paint color that looks great on vinyl siding. But there are certain things you should keep in mind regardless in choosing a product. This includes getting paint that's the same shade or lighter than the color of your siding instead of something darker or more intense. This is because choosing darker colors than what you're about to paint will make the siding retain more heat, leaving it susceptible to warping and premature expansion. You should also buy paints that contain acrylic and urethane resins because they accommodate the contraction and expansion of vinyl. What's more, the coating is able to stick better without cracking or peeling. In other words, get exterior-use latex urethane paint. 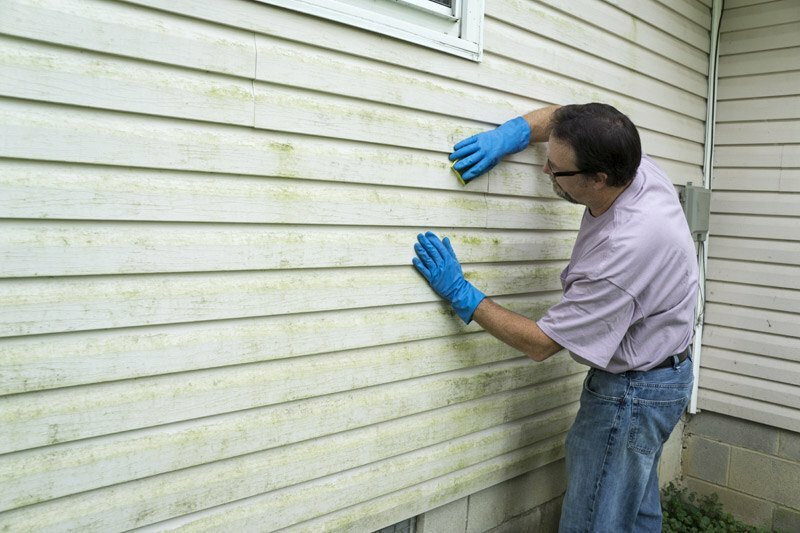 Prepare the surface of your vinyl siding for painting by hand-scrubbing it with the cleaning solution outlined above. It's supposed to remove all the chalkiness, grease, and dirt on your siding. Rinse everything with water to get all the dirt out. Be thorough but don't overdo it to the point of scrubbing so hard you're scratching the siding. You can also clean the siding with a pressure washer, but it's better used by a professional (unless you're experienced in using these washers). You can also use ordinary detergent and oxygen bleach cleaner to clean up the siding. Just check with the Vinyl Siding Institute for safe solutions you can use on the siding that won't ruin it. You should specifically remove buildup, mildew, mold, and debris on the vinyl surface. There are people who believe that you should definitely put primer on your vinyl siding prior to applying the finishing coat. Many pros use it more often than not. There are others however who recommend putting in primer if the condition of the siding is particularly terrible. If the siding is fine, you can go with the finishing coats instead. Primer should be put on a pitted siding or any siding that shows wear and tear. Ditto with siding that has undergone severe weathering. In this case, the primer serves as your filler material to cover up those imperfections like plaster on a wall prior to you painting it. Remember though that paint sticks to the layer beneath it, so if your primer can't stick to the siding, it will peel along with the finish. Just put it on. You don't have to paint with the grain or sand down the vinyl like it's made of wood. You don't need to apply special application techniques at all. Just scrub the vinyl clean, put on primer if it's in bad shape (so the primer is optional), then put on the finishing coat or coats. You can use a paint roller or a brush. You can also use spray equipment by renting out or buying some for even vinyl painting action. You can even hire someone to do it for you. My personal recommendation for painting with the roller is to back brush or following the roller application with a brush to keep the results as even and without streaks as possible. You're assured full coverage by going for this technique. Like with painting anything else, after you've finished with your first coat let it dry then apply the second coat. You can even start painting with mostly dry paint in light of the properties of acrylic or latex urethane resin paint. Paint sprayers are more even and less wasteful but rollers give you more coverage at a faster rate. The corners are where you can use brushwork instead if you're using a roller. A sprayer is capable of doing detail work reserved for the paintbrush in light of its uniform spraying and accuracy. The entire surface should be evenly coated. Don't let the paint cake on top of each other to prevent the possibility of peeling since paint sticks mostly on the surface under it. As you can see, there's a lot of preparation involved when it comes to painting your vinyl siding. You need to check your warranty, select the right type of paint, prepare the surface by cleaning it completely, decide whether you should put on primer or not, then put on the finish. You also need to choose between paint sprayers or paint roller and brush for applying the paint. Thankfully, the stipulations of your warranty are in your best interest since it lists down lighter shades and latex urethane paint as the recommended paints for you to use on your vinyl siding. do you have to put on a prime coat when painting exterior vinyl siding?